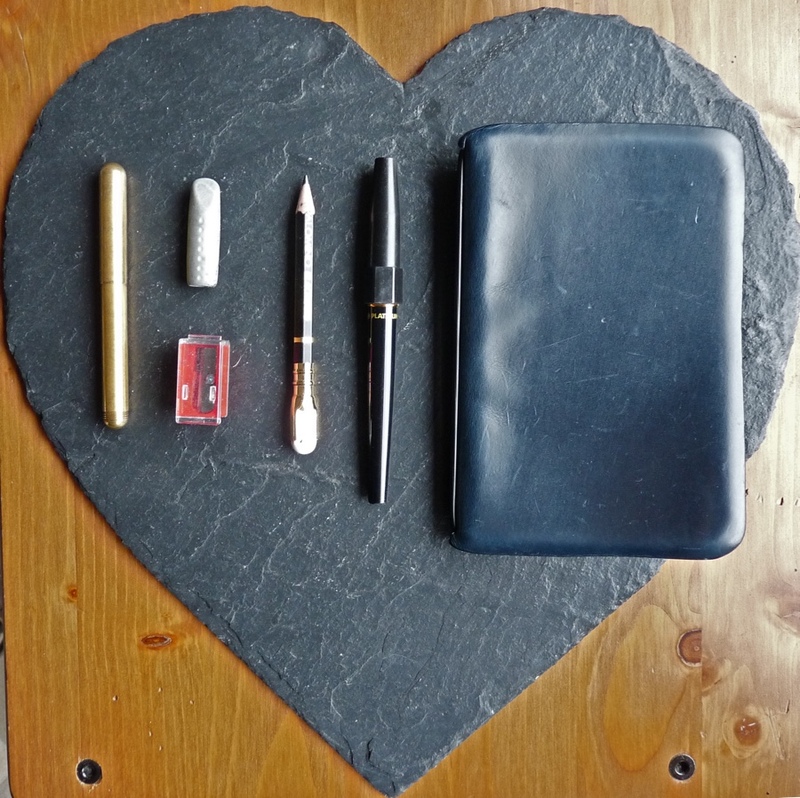 Minimal (Pocket) Sketchkit Update – Pens! Paper! Pencils! I keep thinking I’ve worked out what I’m going to carry around with me in my pocket and then I change my mind. Although I’ve settled on the Kaweco Liliput for a while now, along with plain Calepino notebooks in a Davis Leatherworks cover, everything else has been in a state of flux. I think I’m almost where I want to be now but, as you’ll see, there are improvements still to be made. My requirements are that I should have a fountain pen with me at all times, because I like fountain pens and I want to be able to sketch. I took a Craftsy course by Marc Taro Holmes and that prompted me to want to use pencil and pen for sketching, the pen containing waterproof ink in case I wanted to add watercolour later. I tried putting some De Atramentis Document Ink in the Liliput but it just sat in there for too long and worried me. The nib, although an extra-fine, isn’t fine enough for sketching in a little pocketbook, either. (Not for me, anyway.) Then I came across the Platinum Carbon Pen and after taking some advice offered in the comments of my review, bought a second one and chopped it down to pocket size. This has a Platinum Carbon Ink cartridge in it and is just right: waterproof ink and a very fine nib. The Calepino notebook loves fountain pens and can take a certain amount of watercolour but there is a whole world of not-so-fountain-pen-friendly notebooks out there that I wanted to explore. I now keep two notebooks in the cover, a Calepino for sketching and a second one for notes. I thought I had found the perfect solution for carrying a pencil around in my pocket but the Perfect Pencil has one small flaw that really bothered me. The sharpener doesn’t collect the shavings and so if you’re out somewhere and not near a bin you can to deal with them in some way. I discovered the KUM Mikro Sharpener M1 which is a tiny sharpener that also collects the shavings. This is quite wonderful and pocket-safe. The hinge on the lid isn’t very robust but even what broken it’s still usable and they’re cheap, so I bought a few just to be safe. Having solved the sharpening problem I then gave my bullet pencil another go. This lasted a while but I didn’t like chopping pencils down to fit them in, it didn’t seem a very efficient use of space (a lot of bullet for not a lot of pencil) and the eraser kept coming off. I went in search of a pencil cap and found the Cretacolor Monolith Protective Pencil Cap, a short metal sleeve that does indeed stop the pencil poking into your leg. Unfortunately each time you push it onto the pencil it scrapes a little of the paint from the barrel. I thought I could live with this but I couldn’t. Lurking in a box somewhere I had a few of the Faber-Castell Grip 2001 Eraser Caps. These also stop the pencil from stabbing you and have the advantage of being an eraser so you can carry a pencil around with you that doesn’t have one. They’re not perfect: being a little squishy every now and then the point will snap off inside the cap. I can deal with that a lot better than I can deal with paint being scraped off the barrel. So that’s my setup. A Kaweco Liliput with any ink I like (currently Pilot Iroshizuku Take-Sumi), a Davis Leatherworks cover with two notebooks, a docked Platinum Carbon Pen, a pencil (Palomino Blackwing right now) with a Faber-Castell Eraser Cap and a KUM Mikro Sharpener. Notebooks in a back pocket, the rest in a front pocket along with my wallet. It’s working out pretty well for now. I love this little kit! I wish I could be that minimal, but I always have a need for some color. By the way, I have put Platinum Carbon Black bottled ink in almost all of my fountain pens and even left them idle for a while with no adversity.